Lucky Count gives you a vampire themed title. 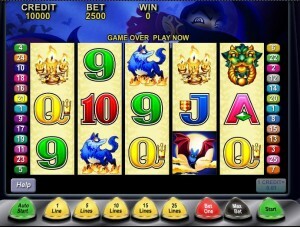 This slot machine was released by Aristocrat and it’s a fairly recent game of theirs. Vampire themed games are as popular as the movies and books which have them as heroes. Count Dracula seems to be the hero in this case, and you can see him in the background, along with quite a few bats. The game is designed in the typical Aristocrat style, with both good and bad sides to the graphics. Lucky Count’s 5 reels are taken over by a total of 25 paylines. 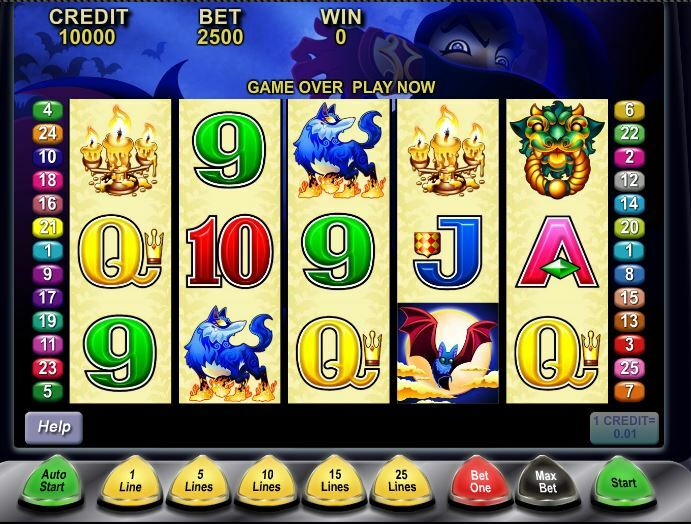 Free games, scatters and two types of wilds, these are the features of the slot. As for its top prizes, they can give you up to $2,000. The game’s two wild symbols will make sure you get paid as often as possible, but there is also a scatter symbol in the game, plus some free spins with triple pay. 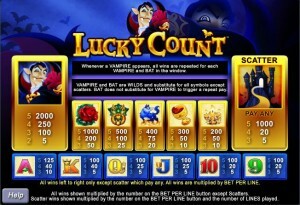 One of the two wild symbols of Lucky Count is the one with the Bat, the other is the Vampire. You’re only getting prizes from the Vampire wild, if it manages to form up its own combo, by landing two to five icons from left to right, on the same bet line. Payouts of up to 2,000x will be offered in that case. One interesting power of the Vampire wild is its ability to repeat all wins, as many times as there are Bat and Vampire wilds present. The Castle is the scatter symbol, the only one of its kind in this game. This symbols gives you very big prizes, but first you need to land enough of them in random locations on the reels. You get paid 5x the bet when three Castles are present, 20x when there are four, and 1,000x the bet for five. 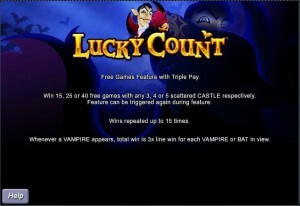 Get three to five scattered Castles, and besides the cash prizes you also win free spins. 15 rounds are triggered when three Castles appear, 25 when there are four and 40 if there are five of them. Whenever one of the Vampire wilds makes an appearance, the total win is 3 times the line win for each Bat or Vampire visible. The option to place a bet allows you to select 1 to 25 lines, and then to increase the wager up to $1 for each one. A $25 maximum bet is possible in this slot. The game’s biggest rewards come from the Vampire wild and the Castle scatter. The former will give you up to 2,000x back, or $2,000. The latter will give you 1,000 times the bet, so up to $25,000. It’s your typical vampire slot machine for the most part. The background picture shows you the vampire as he’s hiding his face with his hand, an image taken at night which has a lot of bats flying nearby. On the reels, there is a certain bat motif to the yellow background image, while the symbols are poker cards and things like medieval castles, bats, red roses, goblets with blood or candles. Symbols: Vampire (2,000x, wild), Bat (wild), Castle (1,000x the bet, scatter), Red Rose (1,000x), Door Knocker (500x), Wolf (400x), Blood Goblet (300x), Candles (200x), Ace (125x), King (100x), Queen (100x), Jack (100x), Ten (100x) and Nine (100x). 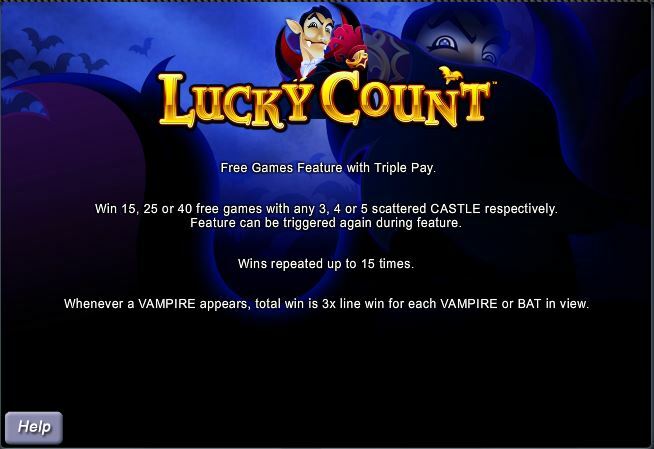 Vampire themed slots tend to be quite fun to play, and Lucky Count is no exception. It even has some interesting new features, mostly related to the wilds. 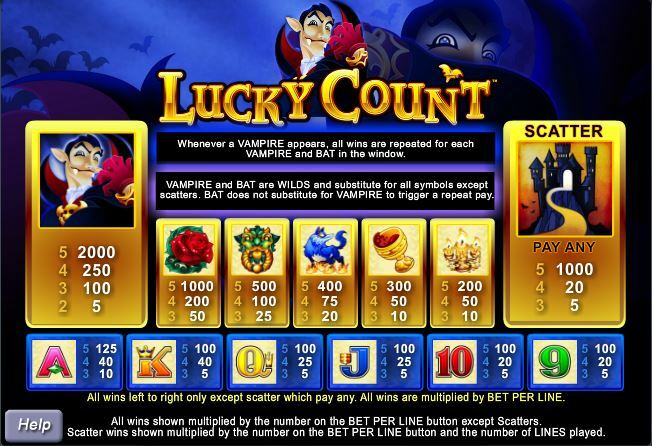 Lucky Count can be found at any Aristocrat casino, where you get a chance to play it for real money or in free mode.